Note: please make sure you read my previous post. The story picks up where that one left off. 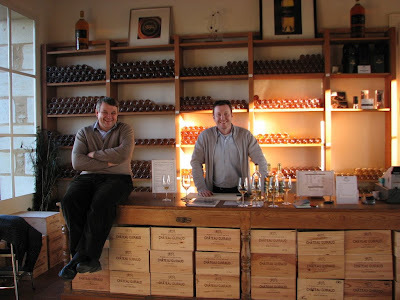 It covers my visit to Chateau Guiraud, the conversations with the winemaker Xavier Planty, and some of the recommended food and wine pairings for Sauternes. I had not tasted many Sauternes before. And the ones I had, were tasty sweet wines but hardly special. 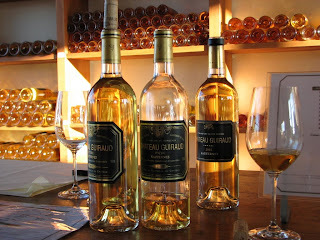 I had never tried a Guiraud from a great vintage. A man came toward us in the parking lot and smilingly introduced himself as Xavier Planty, a co-owner of Chateau Guiraud (pronounced "Gee-rrraw"). Xavier had been managing the Chateau since the 80’s, but only recently acquired a 10% stake in the business. Though only a 10% co-owner, it was obvious that he was the heart-and-soul of this whole operation. Standing in the parking lot in front of his tasting room, after a brief introduction, Xavier answered a couple of my questions... and after quickly realizing that he is not dealing with your average tourists, things got interesting. 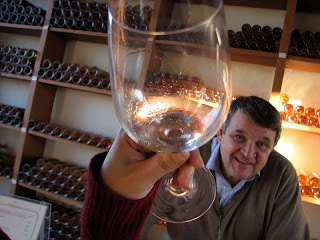 As we headed to his impeccably neat production facility, he began pouring juicy morsels of his Sauternes wisdom on us. 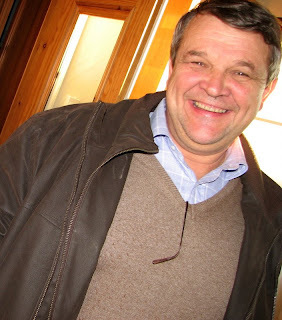 The Sauternes is primarily made in the vineyard, Xavier Planty explained. Grapes have to be perfect when picked. For Sauternes, of course, the definition of perfect is totally different than for most other wines. For Sautneres, perfection refers to the level of rot, or rather “noble rot” aka Botrytis, that afflicts each grape until the grapes reach the highest levels of sweetness while still maintaining enough liquid and acidity to keep the resulting juice from turning into syrup. Because Botrytis attacks each cluster unevenly, the pickers go through multiple iterations (ranging over many days) hand-picking only the clusters (or grapes within clusters) that are “perfect” – a labor-intensive and costly process. This is the most critical time in the cycle of Sauternes making. 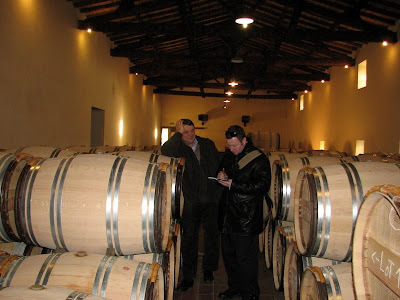 Once the grapes are picked, Xavier follows a fairly conventional procedure of fermenting grapes from different parcels and different harvest days in separate barrels, using barrels from several different makers, each one imparting a slightly different oak flavor into the wine, and eventually combining them at a later point, when he determines the final blend. 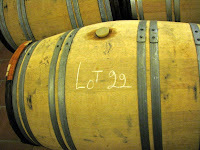 Fermentation finishes at different times in different barrels, depending on the date of grape picking and the vigor of the yeasts in that barrel. In Sauternes, fermentation finishes naturally, since the extremely high level of sugar in the grapes results in high-degree of alcohol which kills the yeast that created it in the first place, before all sugars are fully digested. Xavier proudly pointed out that he does not add any sugar to his grape juice, as some less scrupulous chateaux (he declined to name them) might, because his grapes achieve high sugar naturally. In those years (like 2008) when not all of his grapes ripen perfectly, he throws away the imperfect grapes, thus resulting in much smaller production for that vintage (the winery takes a costly hit in order to maintain quality). Deciding when each barrel has finished effective fermentation is a process of continuous testing and sampling. In this NFL playoff season it occurs to me that wine-making is a lot like coaching. It starts with picking the best raw material - be that players or grapes. It then continues into maturing them such that finally the inherent strengths of individuals blend into a seamless whole. It is not about having any particular piece stick out, but about balance, harmony, completeness, and depth. And when that happens, a championship vintage is born! 30 minutes later, we were in his spacious tasting room, where he proceeded to open the 2004 and 2005 vintages, in addition to his normally offered-for-tasting 2001. Xavier started us with the 2001. It had the expected orange-yellow color, darker than both 2004 and 2005, since Sauternes gets darker and richer as it ages. Casually sitting on top of his bar counter, he observed our reactions. From the get-go Xavier Planty was a very likable character, but until this point my wife's and mine interest in Sauternes had still been rather academic. That all changed after the first whiff of the 2001! With goofy smiles on our faces (and a confident smile on Xavier's), Rona and I looked at each other, as we knew life as we know it would never be the same! (Just kidding! :) But seriously, I was so "shook up" by the aroma, that I failed to record my sniff impression and immediately proceeded to fill my mouth with this nectar. (Mind you, I keep notes for all my tastings - color, nose, and taste. I record the "nose" note before tasting.) Here is what I could muster to write after I swallowed, smiling even wider (I normally don't swallow anything at degustations). "Incredibly plush, rich mouthfeel, orange/lemon peel with tasty slightly bitter finish." 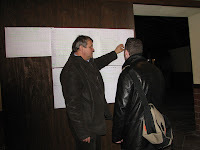 That is the shortest tasting note I wrote in my entire trip to France after tasting at least a hundred wines. I just drank some more, noting the high alcohol percentage on the label (but not in my mouth), while continuing to sip... I found it impossible to describe the complexity of the flavor that developed in just 7 years after the harvest. Yes it had something apricoty, peachy, citrusy, all that good stuff. But there was definitely more - sort of liqueur-like fermented flavor (imparted by Botrytis) that made the wine richer and more amazing, unlike any other sweet wine I had ever tasted. "Golden yellow. Butterscotch and vanilla, with hints of ripe apples. Full-bodied, with lots of sweetness and a spicy apricot and honey aftertaste. Excellent concentration and balance. Loads of botrytis character on the finish. Intense. Hard not to drink now because it's so luscious and rich. Best after 2008. 11,665 cases made. –JS"
Xavier told us that a Sauternes improves for a 100 years, and anything less than 10 years old is considered (too) young. In 4 years since the Wine Spectator tasting note was taken, the wine invariably got more complex. Now, if that lesser-decorated vintage was so amazing, the 2005 - the #4 wine of the year - must be out of this world, right? Well, next he poured the 2005. Dying with anticipation, I stuck my nose in the glass, and immediately got a heavy doze of Sauvignon Blanc aroma that I did not expect -- leaner, greener, and fresher than 2001. 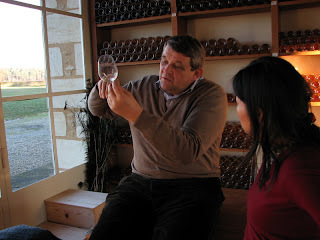 Xavier explained that unlike other Sauternes chateaux, he uses a significantly higher percentage (35-45%) of Sauvignon Blanc. Freshness is a key differentiator of a great Sauternes from merely a good one. The extra Sauvignon contributes acidity and greenness that balance out the heavy sugars from the mold-shriveled grapes. The combination of green apple and lime with the botrytised sweetness was extremely intriguing on my palate. Still, while more refreshing, the wine was far less delicious and plush than the 2001. 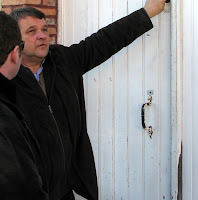 Xavier was quick to point out: that is why aging is so important for Sauternes. He is sure that with time, the 2005 will outshine the 2001. And given the Wine Spectator scores, the critics agree. I can’t wait! For comparison, we tried the 2004, known to be a lesser vintage. This provided an excellent illustration of the importance of a vintage, as indeed 2004 was ordinary and reminded me of other Sauternes I had tasted in the past. When I inquired into the ideal food pairing for his sweet wines, Xavier’s reaction was somewhat unexpected. With best Sauternes having freshness, acidity, and complexity going well beyond simple fruit descriptions, such wines pair not just with desserts but with many other sweet and pungent foods such as the classic pairing with foie gras (but would also be interesting to try with Asian and Moroccan cuisines). In fact, as Xavier was slightly unhappy to hear his Sauternes called a “dessert wine”, as he explained to me they don’t look at Sauternes as dessert wine, but something much more grand – an exalted complex, full-bodied and lusciously viscous white wine full of sweetness, acidity, and white fruit (apricots, citrus and lots of others) that should match with many foods of complimentary or sometimes opposing flavors (as in another classic pairing of Sauternes and blue cheese). The French, he explained, pair Sauternes much more broadly, as they consider all the Sauternes flavors, not just the sugar. To prove his point, since he knew we were from San Francisco, he suggested next time we come to visit he will "crack open some crabs". Can't wait! Inspired with that knowledge the next day at lunch I could not resist the classic pairing of Sauternes with foie gras at a fantastic little restaurant in the town of Blanquefort in Medoc called Hostellerie des Criquets. 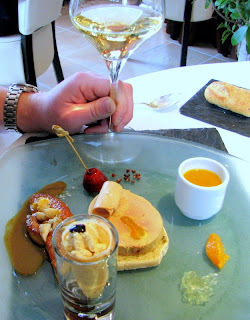 While the Sauternes offered at the restaurant by the glass was vastly less exalted that the 2001 Guiraud, it nevertheless was a delightful match for the cornucopia of foie gras preparations on my plate, and was clear proof that Sauternes is not just for desserts! The foie gras was followed by a dish of scallops with truffle sauce and shredded turnips - for which once again the Sauternes was a supreme match! 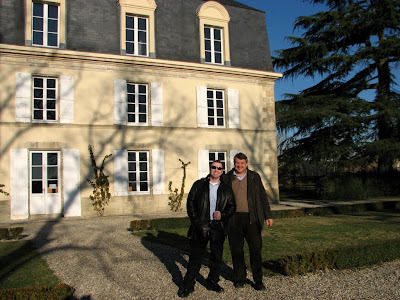 Two hours after we arrived at Chateau Guiraud, with our taste buds tingling and our minds opened up, excited by Xavier Planty’s wine and personality, we reluctantly bid our good-byes, knowing that we should never call a Sauternes a dessert wine. 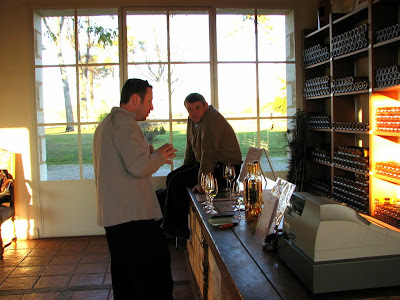 Dessert wine it is not – Sauternes it is! Steve, thanks for the link! Very informative to hear more about the 2007's and 2009's.